You’re also told that you can even earn from single time the ads are clicked on for the duration that you own them… So it kind of sounds like a win-win, but is this really a legitimate way to make money? Or will Clicks Dealer scam you instead & end up just parting you with your cash? Thankfully you’ve landed in exactly the right place to find out as I’ve taken a closer look into exactly how Clicks Dealer works & in this honest review I’ll be uncovering the full truth about them, as well as outlining whether or not you can really make any money with them like they promise you can. ?? What Exactly Is Clicks Dealer? Clicks Dealer is an interesting concept, and I’m not gonna lie in all my years of working online it’s a concept I’ve never previously come across… Which initially made me pretty sceptical of the whole thing. They describe themselves as providing a great platform for those looking to make money from home & wanting a quick, easy way to get started. You’re told you can simply sign up, browse & buy banner ads – and then resell them later for profit as they (hopefully) increase in value, which is what they call “ad flipping”. Now initially I thought what the heck is ad flipping? As like I say it’s a concept I’ve never previously heard of & at first I couldn’t see how it was possible to profit from such a concept at all… Until I took a closer look. And after taking a closer look I discovered that it’s actually an interesting, new, unique concept – that you could indeed potentially profit from. Plus, the added perk is that you are not only able to potentially profit from buying & reselling banner ads, but you’re also able to generate extra income for as long as you hold onto the advertisements too. That’s because they also give you the opportunity to earn a percentage of the revenue generated each time that any of the ads you own clicked on… So you have the potential to generate a smaller passive income by holding onto ads, and the potential to earn a larger one-off income by reselling them. How Does Clicks Dealer Work? Well the first thing I’ll point out is that even though the “theory” behind it which I’m about to explain might be a little confusing for somebody new to making money online, the Clicks Dealer platform itself is actually pretty straight forward… Meaning even beginners, as well as more experienced folk can quite easily use the platform to get started with flipping ads. You don’t need experience & you don’t technically need to know how it works… But of course whenever you’re contemplating investing money into something it’s always nice (and advisable) to have an understanding of what’s actually going on, which is why I want to explain that to you here right now. As I mentioned above the Clicks Dealer process itself is pretty darn straight forward. You sign up, deposit some funds, browse their database of banner ads & choose which ones you’d like to invest in. Then, as soon as you’ve selected & purchased the banner ads they become yours instantaneously – so right that from moment you will stand to earn a percentage of the revenue that the ad happens to generate… And you will also have the opportunity to click “resell” to put it back into the marketplace. Take note though – I’m not saying that you will make money instantaneously here (as that depends on the banners performance which I will touch on in a moment) but ultimately a percentage of any money the banner generates after you purchase it will be rightfully yours, no matter how soon it happens. There is however also a risk that the banner may not generate anything at all, but this risk is reduced by knowing what to look for in the marketplace (which is explained in their members introductory video) – but in this instance you do still get the option to resell the banner back on, though the value achievable, as you can likely expect may be somewhat less than what you initially paid for it. But anyway, once you’ve purchased a banner (or banners) you’ll be able to manage them from within your account & you’ll be able to track the revenue that each one of them is generating. From there it’s then completely up to you as to whether you want to hold onto them, or whether you want to resell them in the hope that somebody else will purchase them for a higher price. Once you put them up for resale they will simply go back into the marketplace for other Clicks Dealer members to purchase – and the value will be based off the revenue that the ad was generating… So if the ad begins to generate more revenue, the value will increase & you can stand a chance to profit should another member happen to be interested in purchasing it. Okay so I’ll admit, this was the part that initially had me feeling sceptical about the whole thing because I just couldn’t “see into” the ad flipping concept, and couldn’t figure out how money could be generated by buying & selling ads.. Until I delved further into it. Basically the company behind Clicks Dealer, Clicks Revenue LTD, is a media-buying company & they have a network of websites on which various advertisements are displayed. Now whether this network of sites is owned by Clicks Dealer, or whether they just rent the ad positions I don’t know – but either way they have access to this network of sites. So here’s the deal – when you are purchasing a banner ad via Clicks Dealer, you’re essentially purchasing “the rights” to that banner, in that position, on that website – so you essentially “own” that banner in that spot. However you don’t get to change the banner or alter it in any way – instead the banner remains as it is, and the owner of the website it’s being displayed on gets paid by the advertiser as he/she normally would… However once you own it, a percentage of the profits are paid to you via Clicks Dealer. So each time the ad gets clicked, the person who owns the website (whether that be Clicks Revenue LTD or an independent owner) makes money, and a percentage of that is paid out to the “owner” of the ad via Clicks Dealer. Therefore after taking a closer look into it I can see that the concept is legit – and that you could potentially profit in such a way. The only downside though is that Clicks Dealer do not share details of the website that the banner is displayed on (to the best of my knowledge) which means it’s a bit of a “blind investment”… So instead of going off stats, you have to go off the fact that “price reflects profits”… Meaning the higher the price of an ad, the more likely you would expect to stand to make money. The fallback that you have though is the ability to resell the ad on – though if revenue has dropped, then the value will have likely dropped too… So there is some risk involved, but as I also mentioned earlier in this review that is minimized by following the instructions outlined in the introductory video to know what to look out for. My Verdict – Is Clicks Dealer a Scam? 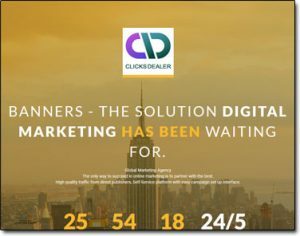 In my opinion no, Clicks Dealer does not seem to be scam – the concept is pretty interesting, new, and could indeed potentially see you landing a good little earner if you happen to purchase a banner that receives a solid number of clicks. Now with the concept being so new and Clicks Dealer being the first website I’ve come across to operate on this concept I’m sure there is likely some ironing out to do with the platform but it already seems to have gained a lot of traction in a relatively short space of time. One thing you do have to bear in mind though is that ultimately the ROI you generate will be dependant on the banners you purchase, so whilst 1 might give you a good return, another may not – therefore it might take some trial & error before you successfully turn a profit. However overall like I say the concept does definitely seem very interesting & I definitely see how this could work, in fact I wouldn’t be surprised if other companies also end up surfacing offering their members a similar method of making money online. It basically gives people who might not have the know-how or time to start a website the opportunity to tap-into the revenue that’s already being generated from existing websites, which also adds “speed” to the process too. So overall I will say that Clicks Dealer certainly looks like a promising up & coming site, and the concept it operates on could certainly enable people to earn more stable revenue online quicker than they previously could before. Larry’s Cash Machine Review – Another Scam System?